We have been trusted time and time again to get your project done right the first go around. We offer a wide variety of remodeling services to give your home the updated look you’ve been looking for. Our goal is that our customers end up 100% satisfied with their finished product. Have ideas for your kitchen or bathroom? Contact us to get a conversation	started – to learn what’s possible and how much it could cost. We	may be able to provide suggestions to enhance your vision. Or other possibilities	that you haven’t considered. But you need to take the first step and	contact us today by calling (617) 847-3053. Are you growing tired of your cramped or outdated kitchen? Don’t	move—remodel! At Martin Kitchen and Bath, our remodeling professionals	have more than 25 years of remodeling experience and can ensure you have	the kitchen of your dreams when we finish your project. Your satisfaction	is our number one priority, and each member of our team will go above	and beyond to build the kitchen of your dreams. Call us at (617) 847-3053	to learn how we can make your dream kitchen a reality! We offer complete bathroom remodels including changing tubs, tile, floor,	sinks and more! From adding square footage to your kitchen to changing the countertops	and flooring, we can do it all! No project is too simple or complicated	for our team. Our team is skilled in various areas of remodeling and have	helped hundreds of homeowners enhance their homes. All our remodeling	services are affordable and we utilize the highest-quality materials and	products so your remodel can last. Your home is where you spend most of	your time, and we want you to enjoy every minute. After 25 years of general contracting, we now exclusively specialize in	kitchens and bathrooms. When you need a reliable, affordable, and timely	kitchen and bath remodeling company, you can count on us at Martin Kitchen	and Bath! 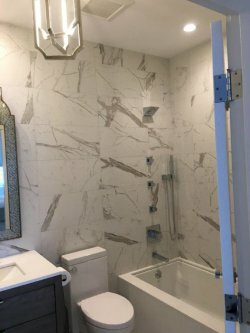 Once we determine a timeline for your project, our team of professional	tradesmen will adhere to it and finish your kitchen/bath on time, so you	can have your kitchen/bathroom back to normal in no time. Don’t hire an expensive, less experienced company when you can work	with us at Martin Kitchen and Bath. Our experience allows us to finish	projects when we say we will, and also provide the best possible remodeling	services—without charging you excessive amounts of money. Free estimates	are available for all our services, so	call us at (617) 847-3053 today!